Advance travel planners take note: Crystal Cruises’ entire 2015 through early 2016 collection of worldwide luxury cruises is now open for booking. Also, new “Book Now” fares for the remainder of sailings in 2013 and all of 2014, as well as 2015 through May 2016, debuted this week, guaranteed only until October 31. While current promotions offer compelling savings (up to $7,500 per person! ), Crystal did increase fares on 31 voyages – the most-ever since Crystal introduced 60-day “Book Now” price windows. Complete cruise fares and itineraries are now detailed on Crystal’s website and in new Fare & Itinerary Guides that showcase Crystal’s new stateroom categories, including the recently-announced allergy-friendly Deluxe PURE Staterooms, as well as Penthouse amenities, Crystal Serenity and Crystal Symphony deck plans, and special offers such as 2-for-1 Air Add-Ons in Australia and Asia, Low Solo Fares, Kids Sail Free, and the Crystal Family Memories Program. 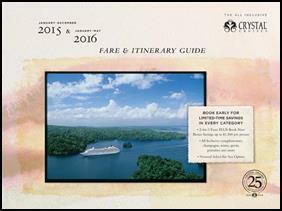 Highlights of 2014-early 2016 include more overnights, in more ports; more shorter cruises; more Asia and Caribbean routes; returns to Africa, the Holy Land, Mexico and Alaska; more than a dozen cities offering round-trip voyages; celebrations of Crystal’s 25th year of sailing and 20th annual World Cruise in 2015; and a plethora of new cruises, maiden calls, and returns to ports less visited around the world. Crystal sails to all seven continents, with voyages of 5-108 days in the Mediterranean, Western Europe, British Isles, Scandinavia/Baltic & Russia, North Cape & Arctic Circle, Africa, Asia, Australia/New Zealand, South Pacific, South America, Antarctica, New England/Canada, Panama Canal, Caribbean, and a sumptuous annual World Cruise departing every January. Until October 31, 2013, per person “Book Now” fares start at $1,950 for the rest of 2013, $1,520 for 2014, $2,295 for 2015, and $2,995 for early 2016, with attractive air add-ons from more than 90 North American gateways.